Suits grooming tables of size 90 x 60 cm and 75 x 50. 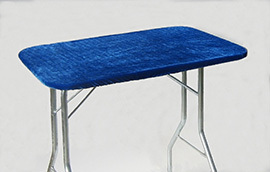 Easily adapted to smaller grooming tables. Ideal and neat as a basis when you photograph your puppies / dogs on the grooming table. Very high quality of stretch velvet that is easily washed at 40 degrees.